The livestock world is up in arms about the EAT-Lancet Report that was launched on 18th January in Oslo and recommends drastic reductions in the consumption of meat, especially red meat. It is the outcome of a committee of “more than 30 world-leading scientists from across the globe to reach a scientific consensus that defines a healthy and sustainable diet” and recommends a plant based diet and almost complete elimination of red meat from our menues. The initiative goes back to a Norwegian billionaire with engagement in the animal rights movement, and one of its collaborators is FRESH, a consortium of global food giants. This includes even those who currently build their riches on the meat economy, such as Cargill and Tyson. The report is being savaged and ridiculed on social media, with the pack being led by Frédéric Leroy, a Belgian professor who has untangled the special interests involved behind the initiative in an article published by the European Food Agency: A powerful action against meat? Many livestock people have been in a frenzy, enumerating the significant nutritional benefits of red meat and pointing out errors in the report. 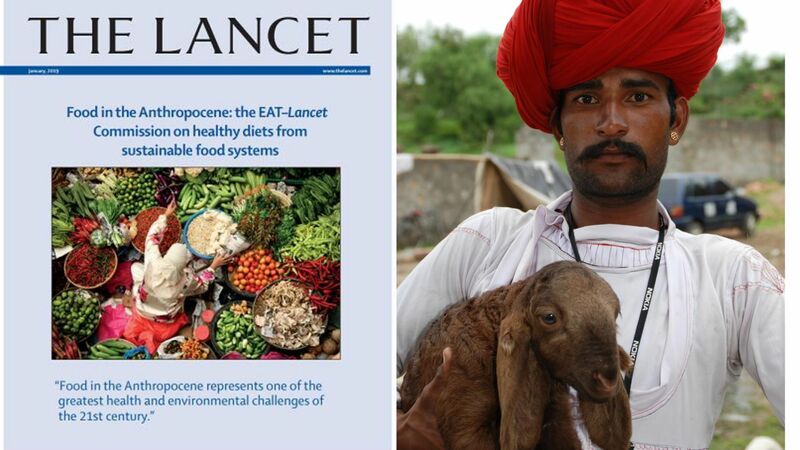 And the EAT-Lancet report definitely has major weaknesses. It is prescriptive and top down, western centric, and promotes a diet that is not feasible for most citizens in the world. But on the other hand, the fact that the EAT-Lancet Report draws attention to the planetary boundaries of our food system is most welcome, the more so as these are being pretty much ignored in on-going UN processes and not tackled anywhere else, although GASL, the Global Agenda for Sustainable Livestock , is making an attempt. What I miss on the part of the “livestock lobby” is a more nuanced consideration of how meat is produced, instead of its blanket endorsement. Some introspection and analysis of how we got to the current vegan assault would be very much in order. Because it MATTERS how animals are kept – whether confined and pumped full with concentrate, or moving, foraging on their own, in a herd! It matters to the animals, to the consumer, to animal and human health, and to the planet! For too long, the large majority of animal scientists – with a few notable exceptions – have subscribed to what I term the “efficiency paradigm”, the belief in “sustainable intensification” that reduces animals to input-output models and basically leaves no room for animal welfare, besides ignoring the need for a circular livestock economy. The FAO has had a big part in this, on one hand raising awareness about livestock’s long shadow (good), but on the other hand uncritically promoting the stance that “we need to double livestock production by 2050,” and spreading the mantra that this has to be achieved through higher natural resource use efficiency. While the ILRI white paper for the World Economic Forum in Davos makes many good points by emphasizing the crucial role of livestock for the poor, it talks about industrial systems as option. In the long term, these systems will be phased out and be replaced with artificial meat/clean meat – or at least this is the future that the food companies are preparing for, and maybe one of the reasons for them supporting “plant-based” diets. There are of course still many question marks about “clean meat”, as summarized in another paper about alternative protein sources prepared for the World Economic Forum in Davos. In all this clamour, some seminal new research is not getting the attention it deserves. A team of reputed researchers led by a scientist from Wageningen University in a paper entitled “Defining a land boundary for sustainable livestock consumption” points at a solution that challenges the beliefs of both vegans and FAO: They propose that if we stop industrial livestock farming and feed cultivation, replacing it with “low-cost livestock” that is fed with either waste food or with biomass from non-arable land, while at the same time reducing consumption in western countries, there would still be scope for raising protein consumption in Africa and Asia. Their conclusion is that trying to sustain the human population on plant food alone would actually require MORE land, as without livestock crop by-products would not be utilized for food. This conclusion is a clear endorsement of pastoralism and damning to the “efficiency paradigm”. The direction for the future of livestock is clear: Support pastoralists with their humane livestock production systems to continue managing non-arable zones for food production, biodiversity conservation and as carbon sinks. In arable areas, limit livestock to what can be sustained with local crop waste. Eliminate industrial systems and replace them with artificial or clean meat – if it works. Perfect!